i had the best of plans, the image in my head, the day exhausting and coming to an early almost-end, or at least a long break, not wanting to write anything introspective, just wanting to open the door and let a little christmas in. 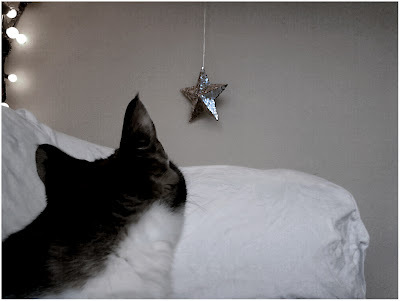 it was not the star i wanted, that star is at home and i am still not, and lily ignored me for a minute or two, but only a minute or two, until the star began to twirl and twist, and then, yes indeedy, it had her attention. and this long rushrushrush day was suddenly a bit better. that star would not stay still no matter how much blue tape i used betwixt it and the wall and i just gave in. to the twirling and staring and star-stalking and suddenly i was laughing and just taking pictures and christmas was in the door and the star was laughing too. when it fell, tiny pieces from its smiling face landed on the carpet behind the couch, and i think i'll let them stay. i bet they will shine when i'm not looking. that's what we're aiming for!!! and lilycat knows the way to bring it. i bet they will shine when you're not looking....actually, i know they will !! debi this was beautiful....and the fact that the star made you laugh while lily was intrigued....ahhh, christmas spirit !! yes, i am sure that they will shine...i have had several of those rushrushrush days myself lately, so hold onto these moments, when the spirit creeps in and makes you smile. Beautiful post, it's often when you sit back and relax, laugh and don't feel that you have to control stuff that you find the greatest joy. great captures ..i like the space "behind the couch" I leave stuff there .. isnt that what it is for?! Such inspiring posts from both you & Graciel this morning...."just get out of your own way & it will happen". Thanks for the reminder. I don't need a lot...but your words, your words --- they refresh when it feels like all the world wants is my soul. oh, Lily! I'm so glad the star didn't stay still. =) The unexpected wonder of things that don't go quite right... fabulous. i'm now crying at work, thank you very much. it's the poignancy of this post that got to me. argh. and i, too, have a cat so you had me at the first pic. Yes I do love a twirling star and smiling faces. Shine on, shine on silver star. I love that little tilt of the head. 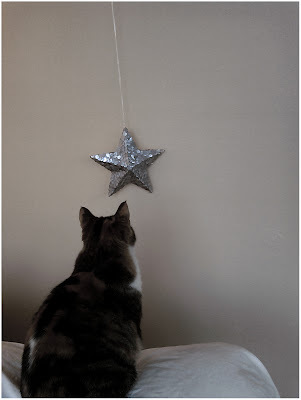 I think she loves that star as much as you.